Yes, It’s true. I made the cupcakes for my wedding! Now I’m no perfectionist! My goal with any DIY that I do is to have it be functional and look nice. I made two different kind of cake. Lemon and Vanilla to go with our White and Yellow theme. And yes, I did use box cake mixes and store bought frosting! There just wasn’t enough time to do it from scratch. The Lemon cupcakes were a huge hit! And the lemon icing was way easier to pipe than the vanilla. The vanilla was more thick and actually hurt my arms to squeeze the piping bag. Typically when I make cupcakes I just get white wrappers but I decided to be a bit fancier for the wedding. I used silver wrappers and then added a cupcake skirt around them for added cuteness. Note that you should never bake a cupcake with the skirt on it. Only bake cupcakes in cupcake wrappers. For the fanciness, I piped on the icing in a spiral, added some beaded sprinkles, and added a couple Love toothpicks. Nick created the stand out of really thick poster board while I was icing the cupcakes. Here’s some fun photos from the wedding! I especially love the one of Lola getting the first taste! These turned out great! I love making cupcakes but they never turn out so pretty! Omg these look so good and easy enough to make! I wish I had these for my engagement party! I love cupcakes! Although I don’t like using pre-made batter, I prefer to make them myself from scratch. You made them look very pretty and festive, even the cat loves them! Thanks! I agree on homemade vs premade. With moving and all, I didn’t have time to homemake though. I ended up baking the cupcakes while meeting my sister in-laws for the first time. Thanks! I put up my backsplash the same week! I don’t know what I was thinking! These look amazing! You are talented!! Beautiful! Even better is that Betty Crocker’s gluten free yellow cake tastes as great as the gluten-filled version. You have a gift. they came out so well! 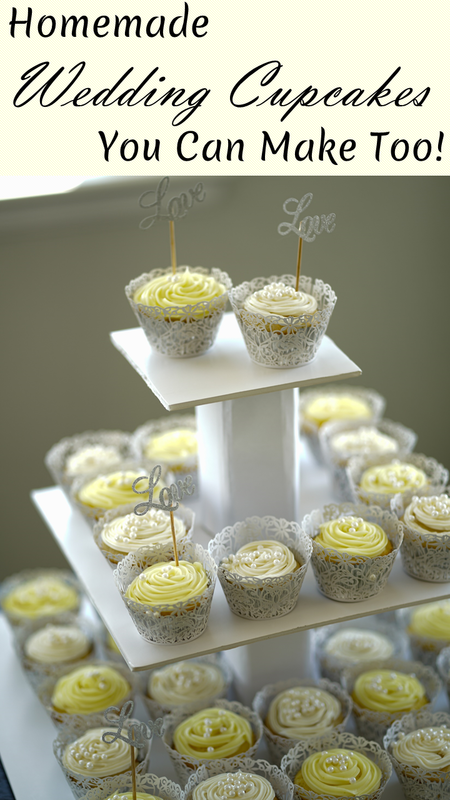 Love lemon cupcakes! Everyone at the party did too! I love any lemon dessert. I love the picture of your kitty licking the cupcake! Too cute! These sound delicious and super easy to make! Lola loves icing! Really loves fruit flavored icing haha. These look so good and simple. Aww they came out so pretty!! I love the lace liner and the little pearls!